The art of quilting is not something new to this world, it has been around for centuries, but still there is no confirmation about the exact origin. According to the historians is that the history of quilting, piecing and applique was widely used for clothing and decorating stuff at home in ancient times. There is a common belief that quilting originated in China and Egypt at the same time. The oldest quilted garment found till now dates back to somewhere around 3400 BC. Back in the 11th century, the crusaders picked up a type of quilting from the Middle East and brought it back to Europe. During that time, quilted piece of cloth was used by the Knights to give them extra cushion under their armor. The Romans were the pioneers in introducing quilted bedding, which was used as mattress. Europeans got hold with this idea and they stuffed sack between two combined mattress. It was in the 15th century when the Europeans found quilting as a necessity when they were troubled by cold winds in the winter season. The very first quilts were made of few layers of cloth that was attached together with running stitches. Quilt Frames came into existence as it was difficult to stitch many layers of cloth together. Europeans, blessed with these frames started to create quilts that were more decorative, more finely stitched. 19th century marked a great period of quilting in Europe and America. 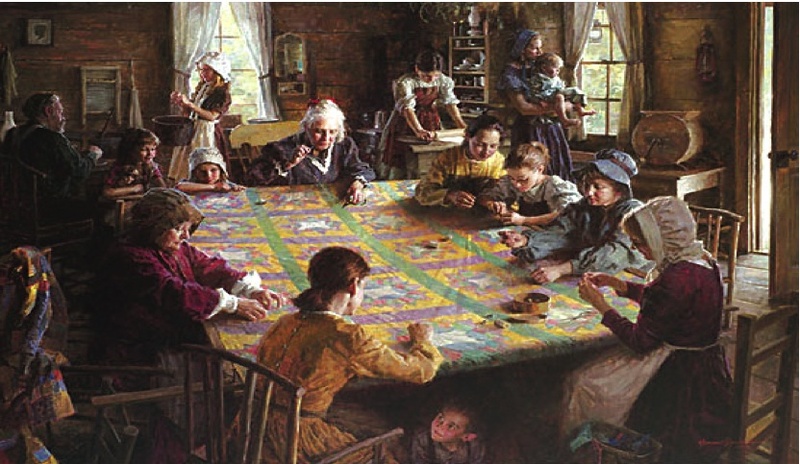 People in villages would come together and make one or more quilts in an afternoon. Women were very pleased with this as they could come out of the boundaries of their home and could contribute in doing something useful.